Today we have an invasion of zombies with the popular TV show THE WALKING DEAD, that is based on the graphic novel of the same name. 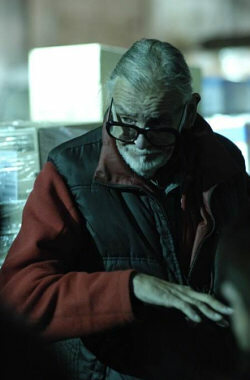 But it all started with one man, GEORGE A. ROMERO, who began his directing career by shooting mostly short films and commercials. He and his friends formed IMAGE TEN PRODUCTION. In the late 1960’s they all chipped in roughly $10,000 a piece to produce a movie that became one of the most celebrated American horror films of all time, NIGHT OF THE LIVING DEAD, which George wrote and directed. The movie became a cult classic by the early 1970’s that was inducted into the NATIONAL FILM REGISTRY OF THE LIBRARY OF CONGRESS OF THE UNITED STATES in 1999. He is still making dead movies. Recently arrived on DVD are the 2007 DIARY OF THE DEAD, and 2009 SURVIVAL OF THE DEAD. Comments for George A. Romero/The Father of the Dead are now closed.